I am a Kindergarten teacher by day and a mommy/Stampin' Up Demonstrator by night/weekends or whenever I can find a minute to stamp and scrap! Why don't you join one of my stamping or scrapping clubs?!! This content is my sole responsibility as an independent Stampin' Up! demonstrator and the use of and content of the classes, services, or products offered here is not endorsed by Stampin' Up! 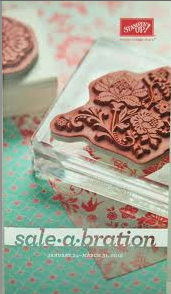 All stamped images (unless other wise stated) are property of and copyrighted by Stampin' Up! 3 Dimensional Projects Big Shot birthday Chocolate Chip Grosgrain Ribbon Christmas clipboards DSP: Designer Series Paper Fast and Fun Notes For Sale!! Gift Items handmade cards In Color: Kiwi Kiss In Color: Melon Mambo In Color Polka Dotted Grosgrain Ribbon Large Oval Punch Layering Love You Much Old Olive One Sheet Wonder Punches Real Red Ribbon Scallop Circle Punch scrapbook spaces Stampin' Up Thank You Cards Top Note Die Uncategorized valentines day Weddings! Here is a quick and easy gift idea. I got these 24 page photo albums for $1 each at my local big box store. 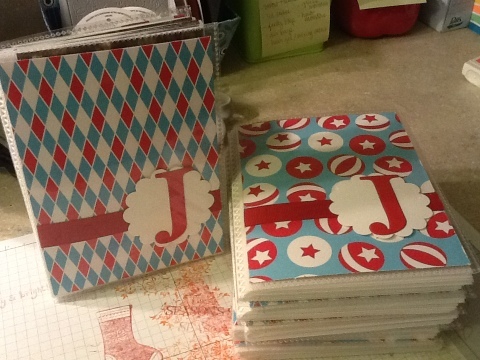 I took out the front and back card stock design that was there and using some Big Top DSP, I made new covers. I used the Big Shot Serif Essentials die to create the “j” monogram. We will give these as gifts for Christmas to all of my son’s grandparents and aunts and uncles. These were really quick and easy and inexpensive too! I really liked making cards yesterday with old soda cans but had been wanting to play with the massive amounts of ribbon I have collected (I’m addicted to Stampin’ Up!’s ribbon). I thought making girls hair bows would help me to put lots of ribbon together at one time. So here you have it, this is what I’ve cranked out in the last 1/2 hour. Everything is Stampin’ Up! except for the hair clips (you can get those at your local big box store). I’m thinking about holding a bow making class –anyone interested? I am writing to tell you about an exciting up-coming Christmas Card class I am putting together! 🙂 It will be held on Saturday, October 16th at my house (directions to follow when you register). We will be making 3 cards of 4 designs each for a total of 12 cards! The cost is $30 and includes envelopes. Most of the designs are quick and easy to make and can be easily replicated for mass production. Payment will be due when you register for the class to hold your spot. For my regular club members, this class will be held at the same time as our regular class…we’ll just be making Christmas cards. Don’t forget to bring daughters (age 8 and up), sisters, friends, or co-workers with you and get $5 off the price of both of your classes! 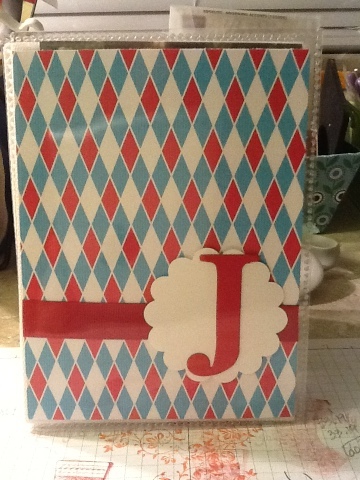 Two classes for just $50 (or if you want to make 24 cards this would be your price). The NEW 2010-2011 Idea Book and Catalog is here! Contact me to day to get your copy! I’m a Thirty-One Bags Consultant!